When you want to show out of town guests a fun time, a trip to Napa is always worth the one hour jaunt north. For folks not from here, it has many of the well known name brand wineries that people like and few unknowns to explore and taste. If you are spending the day, it's usually best to stop and eat somewhere in order to soak up all that wine your tasting and sober up a bit before hitting more wineries or heading back to the city. 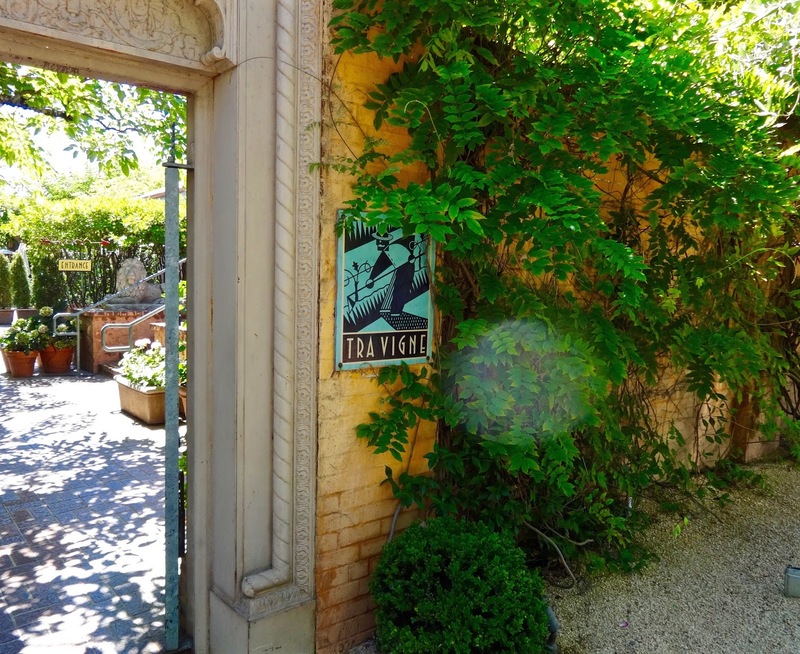 There are a fair number of places along the road through St. Helena, Napa, Calistoga, etc. They range from popular and expensive, to trendy and expensive to just opened and still a little expensive. Such is the nature of Napa Valley. To say that me and the SO have been to Napa many times, is an understatement. Though, strangely enough, we don't often do a sit down restaurant for food when we go. We hit up places like Dean & DeLuca (yes a little pricey too) and just grab and go. This time around we had some relatives in tow and decided to hit up a popular place the SO really likes and one that I've heard about, but never tried, Tra Vigne. It originally became well known due to it's initial association with Michael Chiarello, though he's no longer involved these days. It seemed like a good idea to go all Italian and wine and we were able to secure reservations in advance (always recommended). It's a compact menu of a few salads and appetizers, a pizza or two, some pastas and a couple entree dishes. Since we were doing the Italian thing we decided to stick with what they supposedly do best when ordering. 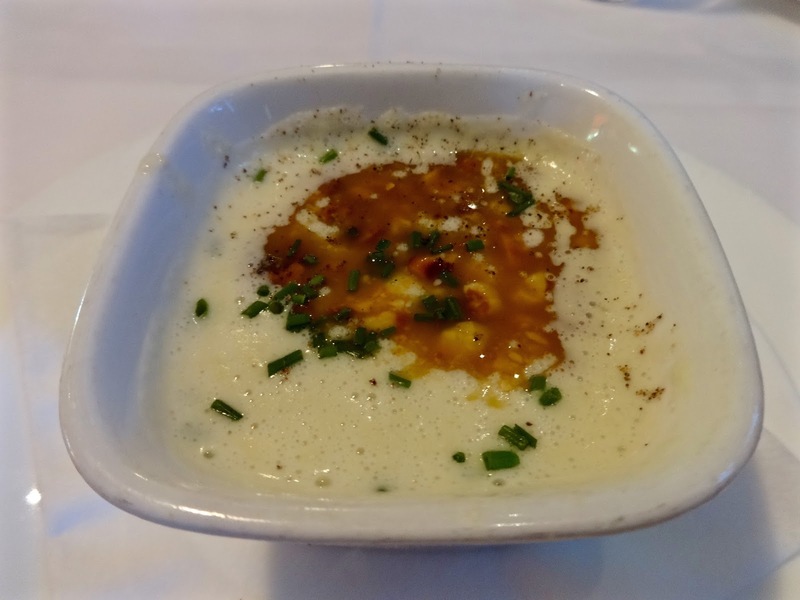 Our only deviation was the first course the Brentwood white corn soup. Grilled white corn, toasted hazelnut pesto and garden chives $10. Warm, creamy and a little sweet, it is a pleasant cup of corn soup. Couldn't really taste any of the grilled part, might have been nice to have some of that smoky flavor. I found it a tad on the one note side. For me it needed a dash of salt and some black pepper to get it to pop some. In general terms it's a nice if unremarkable cup of soup. Next up was their mozzarella "al minuto" $14. House made mozzarella pulled at the time of ordering and served with grilled country style bruschetta. This was my favorite dish of the day. I love a good fresh mozzarella. It was buttery creamy and springy all at once. Served with some hearty, crunchy grilled bread--I mean really, what is better than fresh cheese and bread? (The answer is nothing in case you didn't know.) When you go here this is absolutely the one dish you must get, especially if you are a cheese lover. It comes with some fresh heirlooms drizzled with balsamic and olive oil. You can sort of make your own caprese if you want, but I say enjoy the mozzarella as is, totally yummy. If this was all I had here, I would be perfectly content and ready for more wine. While we were out boozing, I kept thinking how much I was craving pizza and really wanted that when we got here. Surprisingly enough, they really only had one pizza on their menu. It had figs on it, of which I am not a fan. Even though they have their off shoot pizza place next door, they don't really do the pizza choices in the restaurant. I was kind of bummed about this. The waiter said they could do the standard margherita pizza with mozzarella, tomato sauce and basil if I wanted. I sighed and said sure, even though I'd probably already been put off and pre-judged this thing before it hit the table. I mean as pizzas go, it was perfectly acceptable, though it felt like the sad cousin of the previous appetizer. It was a mostly thin-ish crust, oven baked pizza. The sauce was a tad sweet, plus I did want more cheese evenly parsed over it. 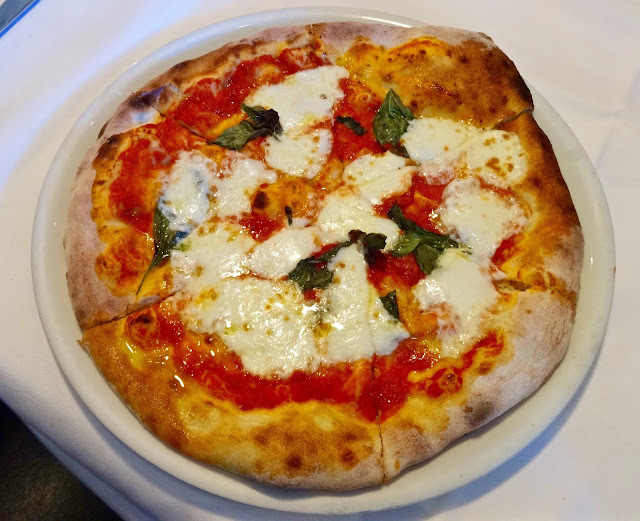 For me it was just an okay pizza, nothing really exceptional about it that made it stand out above other margheritas I've had in the city. But as I said, my judgement may have been clouded by disappointment, hard to know for sure. The SO said it was good, then again, pizza is one of their food groups. Side note, I think they charged us $15 or $16 for it, not really sure. 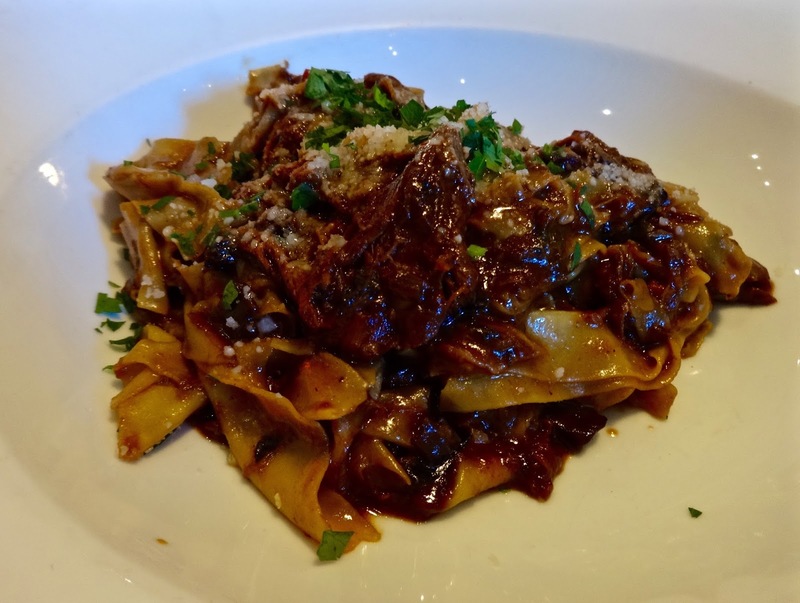 Continuing on our Italian theme, we moved from pizza to pasta with their sage infused pappardelle with braised rabbit ragu, wild mushrooms and grana padano $18. It was a good pasta dish. The rabbit was tender and in the sauce it reminded of a red wine beef with a slight earthy flavor from the mushrooms. The pasta was cooked perfectly, though I couldn't make out the sage very much. Same with the cheese grated on top, the sauce sort of overwhelmed it, though for me, I don't know that it necessarily needed the addition. Overall, a pleasant enough, slightly rustic fall like dish I liked but can't say it knocked my socks off. As far as pasta dishes go, it's decent, though I will say I did prefer that pasta I had from Flour + Water better as theirs seemed a little lighter, delicate and fresher. What can I say, 1 really good dish and 3 good enough dishes. 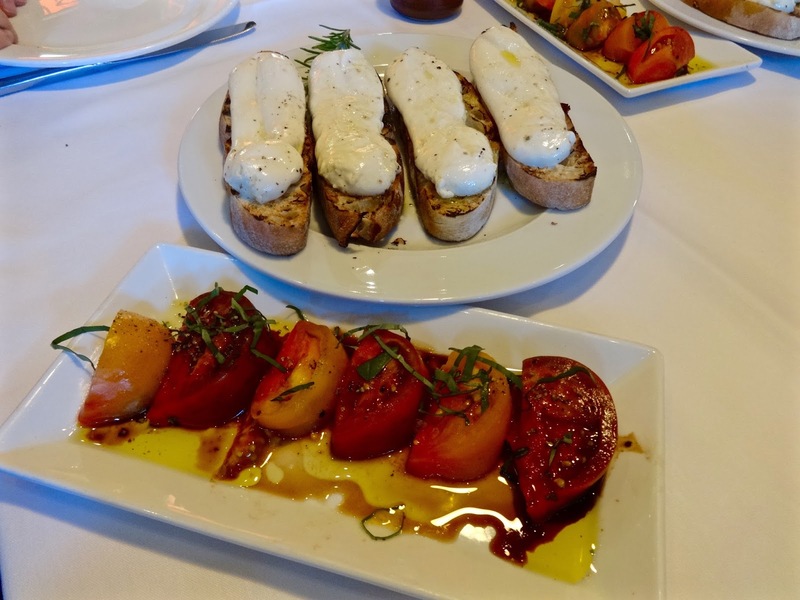 Tra Vigne is serving up sort of traditional Italian trattoria food that's good and will please many palates, though they aren't exactly re-inventing things that will make you sit up and say wow. While I wasn't overwhelmed by the place, I didn't out right dislike it or anything I had, it was all perfectly acceptable. I guess if you are entertaining friends and are unsure of what they'll like, Tra Vigne is a good enough option that everyone will most likely, probably, maybe for sure, almost kind of certainly find something they will enjoy on the menu. I mean, even I found one thing.